Fine & Rare’s BLTC: bacon, lettuce, tomato, and crab on brioche. Photo via Facebook. There’s yet another project coming to Mid-Market, this time in the former Hollywood Billiards space. The building is being razed and an apartment building is going in its place, and according to liquor license activity there’s going to be a food situation on the ground floor. The people named on the license are Scott Peterson and Ted Wilson of the Fine & Rare seafood and wine project. We heard a rumor that it will function as a food court. We’ll fill you in once we hear back from them on their actual plans. [UPDATE: We heard back from Ted Wilson of Fine & Rare and they confirmed that the project is happening and will consist of several local food purveyors, along with a retail component.] 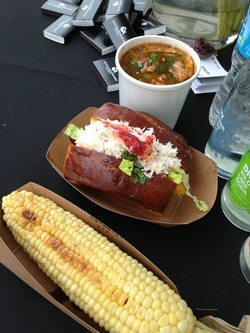 In the meantime, you can catch them at the Sunday Picnic at Off the Grid with their selection of crab rolls, po’boys, and other sustainable seafood dishes. 1028 Market St. at 6th St.